Scandinavia consists of Denmark, Finland, Iceland, Norway and Sweden. All of these countries have a strong craft tradition. They also have political and social similarities - they are all democratic (despite the fact that some of them still have Royal Families) and socially liberal. These humanistic characteristics have had an influence on design, for example through the desire to make good, functional objects that are inexpensive and accessible rather than exclusive. 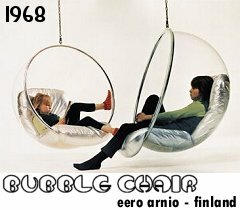 "Scandinavian design has been the topic of scholarly debate, aesthetic merit, and popular appeal for the last 50 years. 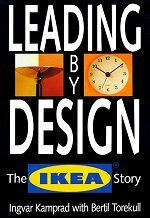 The designation Scandinavian design was first used in the title of an exhibition at Heal's Department store in London in 1951. 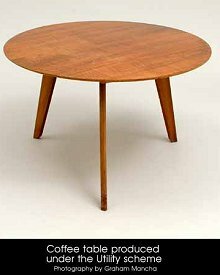 It was called Scandinavian Design for Living and was the commercial counterpart of the exhibition Scandinavia at Table organised by the British Council of Design the same year. 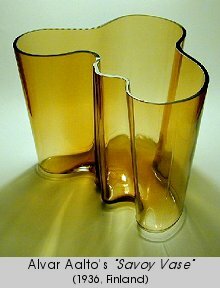 This was the first time the Nordic countries held a collaborative exhibition of design and decorative arts outside the Nordic world. 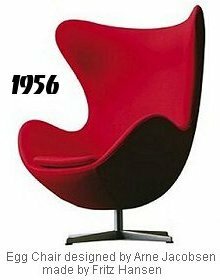 Scandinavian design became a worldwide term when the exhibition Design in Scandinavia travelled in North America during 1954-57. The exhibition was a tremendous success and was highly influential in the development of a type of modernism in the USA and in Europe. 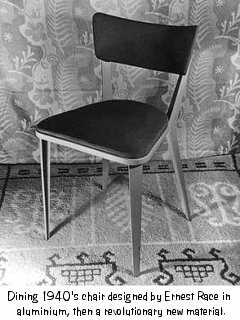 The exhibition Formes Scandinaves, held in Paris in 1958, was equally important, and the Triennal exhibitions in Milan during the 1950s contributed to the consolidation of the concept Scandinavian design as the style of the modern Nordic democracies; light, modest and functional." 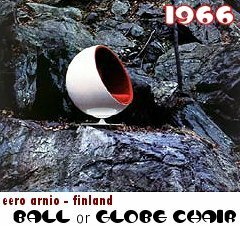 vam.ac.uk/collections/photography/past_exhns/seeing/chair - Was the Keeler pic on a Jacobsen chair? Perhaps one of the most influential industrial designs to come out of Denmark (if you count our earliest influences) - Lego! The system was developed by Ole Kirk Christiansen from the 1940's to 1950's in Denmark, but it was several decades before a susutained marketing and expansion campaign finally made Lego into an almost universal western childhood experience. horst-lehner.mausnet.de/lego/katalog/katalog1.htm - VERY kewl - original 1958 product sheet scans! 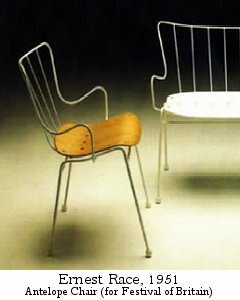 The chair to the right was made from aluminium, a new material at the time. The chair to the left is his most famous piece, the Antelope Chair, produced for the 1951 Festival of Britain and inspired by the stacking chairs of Charles Eames. Most Utility Scheme furniture, however, was not as progressive and modernist as Race's work. A lot of it was very bland, largely due to the requirement for it to have no unnecessary details and no decoration, rather than because of the aesthetics of Modernism. 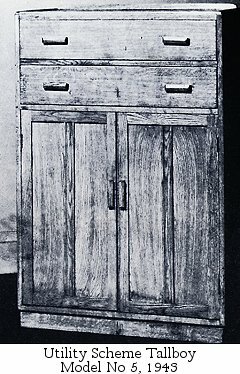 The aim was for functional, inexpensive furniture that used as few resources as possible and that was easily made by relatively unskilled workers in factories with only the most basic fittings. The Utility Scheme commenced in 1942 as a strategy to prevent wastage of timber. The UK was by no means self-sufficient in it's timber supply and the success of the German U-Boat campaigns on British shipping had been devastating. The govenrment felt drastic action was needed, in particular once the bombing raids of London commenced and all available resources had to be used for reconstruction as efficiently as possible. Rationing lasted many years after WWII in the United Kingom, and in some ways the Utility Scheme can be seen as an expression of the culture of "doing without" that had become a defining point of Britain's national identity. 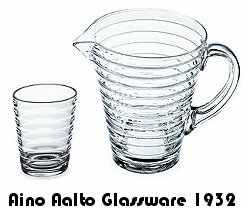 At first, only general specifications for manufacture were made by the government design committee, but then there was concern that the quality of the end products might be poor, and so the degree of control was increased. Furniture makers had to produce exact designs to plans developed by the government committee and had to be licenced to produce the items. To deviate from these designs, or to produce furniture without a permit, could actually lead to imprisonment (although I have no idea if anyone really went to gaol for treasonous cabinetmaking). This strategy was criticised as being a totalitarian crushing of artistry and craftsmanship, in particular after the end of the war when there was no imminent threat of invasion by the Nazis if a decorative moulding was added to a cupboard. Part of the proscriptive way in which the government tried to educate the masses into supporting the Scheme was with surprisingly popular design shows such as the 1946 "Britain Can Make It" exhibition, where "good" and "bad" rooms were displayed, to which the public's responses were meticulously recorded. My favourite visitor comment was: "I would probably shoot myself in either room, but would definitely prefer to do it in the left-hand room". "The exact extent of Gordon Russell's influence within the Utility Advisory Committee is now very difficult to determine and it is dangerous to ascribe too much to one individual, particularly in retrospect. However, all the evidence suggests that he did exert a considerable influence over the style of the furniture that the committee sanctioned. Certainly, the designs finally decided upon exhibit the kind of no-nonsense, straightforward approach to furniture so dear to Rissell's heart. And utility furniture in its simplicity of appearance is quite simialr to the furniture that Russell had been producing in the 1920's and 1930's". From "Home Front Furniture, British Utility Design 1941-1951" by Harriet Dover, Scolar Press 1991. 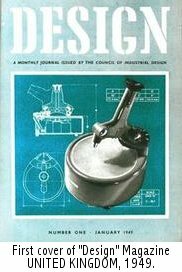 Gordon Russell wrote an interesting article for the first edition of "Design" magazine in 1949 entitled "What is Good Design?" If you're interested in reading more about the Utility Scheme, I have a few old books on the subject - just ask me to lug 'em along to class. There are some very functionalist designs.